An occupied house on the Douglas Creek Estates. The Grand River land dispute, also known as the Caledonia land dispute, came to wide attention in Canada in 2006 when the Six Nations formally reactivated the 1995 litigation against Canada and Ontario. On that date, protesters from the Six Nations of the Grand River began a demonstration to raise awareness about First Nation land claims in Ontario, Canada. 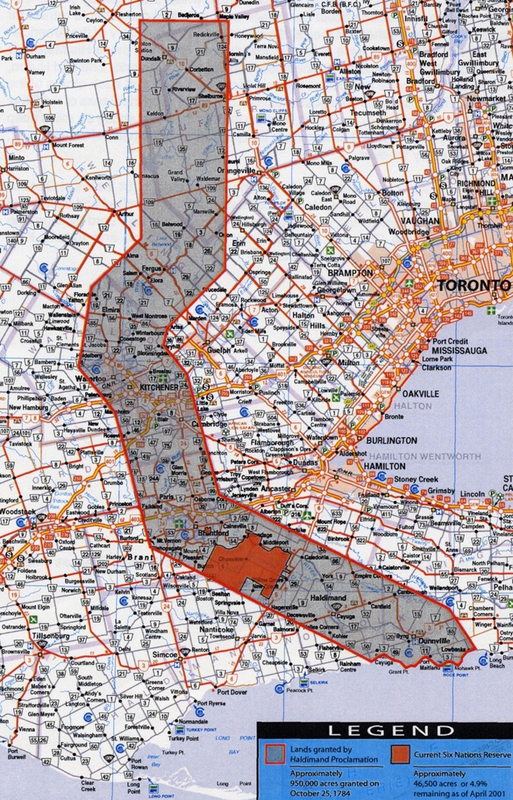 They highlighted their claim to a parcel of land in Caledonia, Ontario, a community within the single-tier municipality of Haldimand County, roughly 20 kilometres southwest of Hamilton. Soon after this demonstration, the demonstrators took control of the disputed land. The land at the centre of the dispute in Caledonia covers 40 hectares, which Henco Industries Ltd. planned to develop as a residential subdivision to be known as the Douglas Creek Estates. It is part of the 385,000-hectare plot of land originally known as the Haldimand Tract, which was granted in 1784 by the British Crown-in-Council to the Six Nations of the Grand River for their use in settlement. Henco argues that the Six Nations surrendered their rights to the land in 1841 and Henco later purchased it from the Government of Canada. The Six Nations, however, maintain that their title to the land was never relinquished, as their chiefs protested at the time and sent a petition to the government arguing against the terms. During the continuing dispute, on June 16, 2006, the Government of Ontario announced it had bought the disputed tract from the developer and would hold it in trust until negotiations settled the claim. Protests during the years included blockade of roads and rail lines, damage to a power station resulting in an area blackout and more than $1 million in repairs, and low levels of violence from both sides, as well as isolated, more serious attacks. The government halted negotiations at times because of public danger from protesters' actions, such as blocking public roads. As protests continued, on June 12, 2006, more than 400 area residents and businesses filed a class-action suit against the Government of Ontario for its "failure to protect them adequately". This was settled in July 2011, with the government paying CA$20 million to class members. By the end of 2011, several criminal cases related to assaults had been prosecuted. 1775 Iroquois Confederation, consisting of Mohawk, Onondaga, Cayuga, Seneca, Oneida and Tuscarora, declare neutrality in war between the British Empire and its North American colonists. However, individual member governments are free to make individual alliances. July 4, 1776 Second Continental Congress adopts Declaration of Independence. Beginning of American War of Independence. 1778 Mohawk, Onondaga, Cayuga and Seneca nations enter alliance with British Empire, in exchange for a guarantee of sovereign territory. They appoint Chief Joseph Brant as their War Chief. Oneida and Tuscarora nations negotiate a similar arrangement with rebel colonies. 1783 Britain enters into Treaty of Paris with United States of America. Neither Mohawk, Onondaga, Cayuga or Seneca are parties to this treaty. However, Great Britain unilaterally cedes these nations' territory south of the Great Lakes to the United States. May 22, 1784: Frederick Haldimand purchases land along the Grand River from the Mississauga nation. I have, at the earnest Desire of many of these His Majesty's faithful Allies purchased a Tract of Land, from the Indians situated between the Lakes Ontario, Erie, & Huron and I do hereby in His Majesty's name authorize and permit the said Mohawk Nation, and such other of the Six Nation Indians as wish to settle in that Quarter to take Possession of, & Settle upon the Banks of the River commonly called Ours [Ouse] or Grand River, running into Lake Erie, allotting to them for that Purpose Six Miles deep from each Side of the River beginning at Lake Erie, & extending in that Proportion to the Head of the said River, which them & their Posterity are to enjoy for ever. January 14, 1793: Lt.-Governor Simcoe confirms the grant with a limited deed. 1795: The Six Nations granted its chief, Joseph Brant, the power of attorney to sell off some of the land and invest the proceeds to provide annuity for tribal members, who were struggling to survive in new settlements. The Crown initially opposed the sales but eventually conceded. 1795 to 1797 Joseph Brant sold 381,480 acres (1,543.8 km2) to land speculators comprising the northern half of the reserve for £85,332. Simcoe opposed this sale. The interest on the annuity promised an income of £5,119 per year, far more than any other Iroquois people had received. The land speculators were unable to sell farm size lots to settlers fast enough and, by 1801, all of the land speculators had fallen behind in their payments. 1825: The Crown approached the Six Nations about developing Plank Road (now Highway 6) and the surrounding area. The Six Nations agreed to lease half a mile of land on each side for the road but did not surrender the land. Lt.-Gov. John Colborne agreed to the lease but his successor, Sir Francis Bond Head, did not. After 1845, despite the protests of the Six Nations, the government sold Plank Road and surrounding lands to third parties. 1840: The government recommended that a reserve of 8,000 hectares be established on the south side of the Grand River and the rest sold or leased. 1841: On January 18, according to the Crown, the Six Nations council agreed to surrender for sale all the lands outside those set aside for a reserve, on the agreement that the government would sell the land and invest the money for them. On February 4, and again on July 7, then again two years later in 1843, the Six Nations petitioned against the surrender, saying they had agreed only to lease the land. 1843: A petition to the Crown said the Six Nations needed a 22,000-hectare reserve and wanted to keep and lease a tier of lots on each side of Plank Road (Highway 6) and several other tracts of land in the Haldimand area. In 1850 the Crown passed a proclamation setting the extent of reserve lands to about 19,000 hectares, which was agreed to by the Six Nations chiefs. 1844: A surrender is signed by 47 Six Nations chiefs that authorized the sale of land to build Plank Road. 1848: The land comprising the current development was sold to George Marlot Ryckman for 57 pounds and 10 shillings; a Crown deed of title was issued to him. 1924: Under the Indian Act, the Government of Canada established an elected government on the Six Nations reserve. They enforced this illegal act by means of brute force by the RCMP who came with guns drawn forcing out the legal and indigenous Haudenosaunee government, in favor of a voting system; This traditional government had previously been in place since its inception in the 12th century. Traditional government went underground at this time. In the first election, only 10 people voted and most likely they were coerced. 1931: Statute of Westminster put into effect; parliament of the United Kingdom relinquishes the ability to legislate on behalf of Canada. All Canadian First Nations affairs are now fully within the jurisdiction of the Canadian Crown. 1992: Henco Industries Ltd. purchased 40 hectares of land for what it would later call the Douglas Creek Estates lands. 1995: Six Nations sued the federal and provincial governments over the land. The developer called it "an accounting claim" for "all assets which were not received but ought to have been received, managed or held by the Crown for the benefit of the Six Nations." 2005: The subdivision plan for Douglas Creek Estates was registered with title to the property guaranteed by the province of Ontario. February 28: The immediate conflict started when a group of members from the nearby Six Nations reserve erected tents, a tipi and a wooden building on 40 hectares of land known as the Douglas Creek Estates. Henco Industries, the developer of the land, obtained an injunction on March 3 ordering the protesters off the land. The Sheriff tried to deliver Justice Matheson's order to the protesters late Sunday evening, March 5. They would not accept delivery. One of the protesters, Dawn Smith, burned the order. The burning was broadcast on local television. The next day the protesters burned the order again. March 9: Justice Marshall made three orders. At Henco's request, he made the March 3 order, the interim and interlocutory injunction, permanent; he adjourned Henco's contempt motion against the First Nations protesters to March 16; and he ordered that the service of the contempt motion on the respondents could be effected by the same methods Justice Matheson had provided for service of the injunction order (by police). March 17: Justice Marshall made a finding of contempt and ordered the Sheriff to go to Douglas Creek Estates, read aloud the March 17 contempt order and the March 3 injunction order of Justice Matheson, and distribute copies to anyone present. Finally, the motions judge ordered that warrants of committal for contempt be issued. However, he delayed their execution for five days to permit the respondents to "quit the blockade and leave Douglas Creek Estates." April 20: More than three weeks after the motions judge's second contempt order, the Ontario Provincial Police (OPP) went to Douglas Creek Estates and arrested twenty-one persons under the warrant of arrest. Later that day, several hundred natives from the Six Nations Reserve, some of whom were masked and were armed with bats, axes and hockey sticks, returned to the site. The police retreated and the natives reclaimed the site and set up roadblocks along the access street. During the evening, the protesters put hundreds of tires across the highway, doused them with gasoline and lit them. In addition, they set fire to a wooden bridge over railway tracks. Firefighters were unable to extinguish both fires because the fire chief stated that he did not believe the OPP could adequately protect his men. Several boxes of documents from the land developer's office inside a model home, were stolen and tossed into a bonfire. A short time later, a hydro substation was destroyed when a truck crashed through its gates and was set on fire. This caused a blackout and $1 million in damages. April 24: Caledonia residents hold a rally demanding an end to the occupation. April 25: Mayor Marie Trainer gave an interview to the CBC, where she said that the residents of the town were being hurt economically by the protest and do not have money coming in automatically every month. The protesters took this as an insult, believing it implied they all received provincial welfare. The Mayor said she did not intend that. The municipal council quickly distanced itself from her comments. April 30: The provincial government appointed former premier David Peterson to help negotiate a settlement in the conflict. May 10: Edward McCarthy of McCarthy & Fowler Barristers and Solicitors called upon the OPP, the Premier of Ontario, the council of Haldimand County, and the Indian Affairs Minister to intervene and restore the rule of law in Caledonia. ... the farms at present in their present occupation and cultivation, and of 20,000 acres (81 km2) as a further reservation, and that the selection of this reservation be deferred until after a general survey of the tract, when the position most advantageous to the general interests and peculiar wants of the Indians can be more judiciously selected. The nations present declare that due notice to their people was had of the times, place and object of their meeting in Council on the 13th inst. as well as of today and believe this their answer to the Commissioner is the wish of the Six Nations without a dissent. The document was signed by 37 chiefs. The Six Nations representatives claim this treaty was fraudulent and repudiated by the Confederacy Council. By a copy of this letter to the Premier of Ontario, I am asking the Premier to direct the relevant Minister to, in turn, direct the OPP to discharge its duty under The Police Services Act and enforce the law in Caledonia. If additional help is required from the RCMP or the army, so be it. Let's get the necessary help and get it forthwith. By a copy of this letter to the Council of Haldimand County, I'm asking Haldimand County to take the necessary steps to enforce their Agreement with the OPP which, under Section 3 thereof, requires the OPP to provide adequate and effective police services in accordance with the needs of the Municipality. This Municipality needs the OPP to bring an end to this activity forthwith. By a copy of this letter to the Federal Minister of Indian Affairs, Jim Prentice, I am asking the federal government to take the necessary steps to assist the Province of Ontario in enforcing the law by declaring a 'Public Order Emergency' under the Emergencies Act (the old War Measures Act), if necessary, in order to get the army to assist the police. May 16: Protesters opened one lane of Argyle St. after an accident closed MacKenzie Rd., the main detour route into Caledonia from points south of Town. After the accident was cleared, protesters closed Argyle St. again, though they agreed to let emergency vehicles through. May 22: At 6am EDT, native protesters removed their blockade on Argyle St. Although the native blockade was removed, traffic remained blocked due to the presence of several dozen residents on the road, who were blocking passage to natives. Around 2pm natives re-established a physical barricade across Argyle St. and the two sides face each other separated by dozens of OPP officers. Scuffles continued to break out throughout the day, resulting in injuries to natives, residents and police. Also, at some point during the afternoon, a fire at a nearby Hydro One substation caused a power blackout throughout Haldimand and in parts of Norfolk. The fire started when natives placed a burning truck in the substation, damaging two transformers. Crews fully restored power to all areas by May 27. Hydro One officials estimated the costs of repairing the damage at $1.5 million. As the world has seen, our protest has been firm but peaceful. Our people are responding without weapons, using only their bodies to assert that we are a sovereign people with a long history and that we cannot be intimidated," said Six Nations Confederacy Chief Allen McNaughton. A state of emergency was declared late in the evening due to the escalation of violence and the power-outage. In Saskatchewan, Cree protesters blockaded the Yellowhead Highway near North Battleford in solidarity with the Six Nations protesters in Caledonia. Following negotiations with the Royal Canadian Mounted Police, the roadblock was removed after about two hours. May 24: After Hydro One crews worked throughout the night; power was restored to Caledonia during the morning hours. June 5: Six Nations protesters and Caledonia residents clashed on the town's main street after a police cruiser drove through an area protesters considered "restricted". June 9: Two elderly Simcoe residents were followed and surrounded in their car in a parking lot away from the occupation site. Native protesters jumped onto the vehicle and threatened to kill them. Residents said that the police did not intervene. Following the altercation in the parking lot, more than 300 Caledonia residents gathered at the Canadian Tire lot. Moving to a place near the construction site, some clashed with OPP officers in full riot gear. Two CH News camera operators were surrounded by Six Nations' protesters and assaulted when they refused to hand over video tape containing footage of an altercation between natives and two non-natives in a parking lot adjacent to the Douglas Creek site. A reporter was later hospitalized with a head injury. Caledonia residents say the OPP did not assist the camera operators, which was affirmed by the camera men. The Hamilton Spectator reported that Lynda Powless, publisher of the Turtle Island News, has produced photos which show OPP officers intervening. During the evening, a U.S. Border Patrol vehicle, with agents reportedly observing the OPP's management of the crisis, was swarmed by Six Nations' protesters. Two occupants were immediately forced out of the vehicle and a protester climbed in. As a third OPP officer tried to escape out the back door, he was injured. The car was driven directly at him and he was narrowly pulled to safety by onlookers. Protesters seized sensitive OPP documents from the vehicle, which included identities of undercover officers and reports from confidential informants. The documents were later returned, but not before they were photocopied and distributed to the media. The Ontario government has asked Six Nations that all photocopies be turned in. The vehicle was returned. Arrest warrants were issued on charges related to this incident for Albert Douglas, 30; Skylar Williams, 22; Arnold Douglas, 61; and Ken Hill, 47, all of Ohsweken; Audra Ann Taillefer, 45, of Victoria, B.C., and Trevor Miller, 30. They face a total of 14 charges including attempted murder, assaulting a police officer, forcible confinement, theft of a motor vehicle, dangerous driving, assault and intimidation. Counter-protesters, onlookers, media gather at the OPP line after the October 15 "March for Freedom"
June 12: A class-action lawsuit is filed by 440 residents, 400 businesses and a handful of sub-contractors, alleging negligence and malfeasance for the failure of the provincial government and the OPP to properly protect citizens who lived near Douglas Creek Estates. Ontario Premier Dalton McGuinty called off negotiations with Aboriginals protesting at the Caledonia site, saying that public safety has been compromised by Friday's violence. He says the province will return to the table only when the barricades come down and native leaders assist police in finding seven suspects in connection with earlier incidents. Aboriginal protesters removed one of the blockades, and negotiations resumed on June 15. June 16: The Ontario provincial government announced that it had bought the disputed site from Henco Industries, the company which had sought to develop the land. It simultaneously announced $1 million in additional compensation for businesses in the Caledonia area adversely affected by the protest. The provincial government is holding the land in trust until settlement of negotiations with the Mohawk of the Bay of Quinte. Also, Audra Ann Taillefer, 45, of Victoria, B.C. was taken into custody on charges of robbery and intimidation, stemming from the June 9 incident involving a Simcoe couple. August 7: Native protesters and non-natives began throwing rocks and golf balls while shouting insults at each other. Approximately 100 people took part in the violent event, which lasted nearly 3 hours. OPP spokesman Constable Dennis Harwood said to The National Post, "There was some property damage, but no injuries were sustained." August 8: At a hearing in a Cayuga courtroom, Superior Court Justice David Marshall ordered the Ontario provincial government to break off negotiations with the Six Nations community until the Protesters have left the disputed land. Six Nations protesters indicated that they had no intention of leaving. August 11: The Government of Ontario announces that it is appealing Superior Court Justice David Marshall's ruling to break off negotiations. The Government will seek a stay of Justice Marshall's order, so that negotiations may resume while the appeal is being prepared. A court date of August 22, 2006 was set in the Court of Appeal for Ontario, where a 3-member panel will determine whether or not to grant a stay. The entrance to the disputed land during the October 15 "Potluck for Peace" held by the people on the site and their supporters. October 15: A rally organized by resident Gary McHale attracted an estimated 400 participants. The rally was blocked from the main entrance to the Douglas Creek Estates by the OPP. Instead, the residents went to the grounds of the school that borders the site. McHale encouraged the rally members to control their tempers. Meanwhile some Six Nations people and their Native and non-Native supporters gathered together for a "Potluck for Peace" on the site under negotiation between the Haudenosaunee Confederacy Council and the Provincial and Federal governments. December 16: OPP arrested Gary McHale for breach of the peace for organizing a rally in Caledonia. January 27: Federal negotiator Barbara McDougall says land claims will not hold up in court. April 12: Haldimand County Mayor Marie Trainer said she received an e-mail from OPP commissioner Julian Fantino implying that the town is encouraging "divisive rallies" at the occupation site. He added that if any officers are harmed, he would not support a renewal of the town's policing contract in 2008 and would back any lawsuit brought against the town by individual officers. An OPP spokesperson said to The Hamilton Spectator that the OPP will neither confirm nor deny the authenticity of the e-Mail because it is correspondence meant for a particular person. September 4: A development site within six miles of the Grand River in Brantford, Ontario, was blocked off by pro-Six Nations protestors. September 13: Sam Gualtieri, a builder, was attacked in a confrontation with native protesters at the 90-home Stirling Woods development and seriously injured. A small group of natives had occupied the property that morning. This assault was one of several criminal cases later prosecuted by the government. April 25: Six Nations protesters blocked off the Highway 6 bypass and a Canadian National Railway to show support for four Mohawk arrested during a protest at Tyendinaga on April 24, 2008; this protest had started in March 2007. Shawn Brant, one of those arrested, was charged with assault with a weapon, breach of bail conditions, possession of weapons and possession of marijuana. At around 4:30pm protestors in Caledonia dug a trench across the Highway 6 bypass and dragged a large part of a hydro tower over the road. The OPP erected two blockades on either side of the bypass to ensure public safety. June 15: Some local residents announce the formation of an unarmed "militia" to enforce laws they feel the Ontario Provincial Police have failed to uphold. June 18: Community Safety Minister Rick Bartolucci says the militia is a "dumb idea." February 22: Haldimand mayor Marie Trainer says that the province is leaning towards giving the Douglas Creek Estates to the Six Nations Band Council, but that she expects it to be some time before a formal decision is reached. July 8: Attorney General Chris Bentley announces a settlement of $20 million ending a class-action lawsuit, filed by 440 residents, 400 businesses and a handful of sub-contractors, which claimed negligence and malfeasance on the part of the provincial government and the OPP for failing to properly protect citizens who lived near Douglas Creek Estates. Some residents are continuing independent lawsuits. December 2: Richard Smoke (Mohawk) is convicted of assault in the 2007 attack on resident builder Sam Gualtieri, which was described in court as "just a notch below culpable homicide". Gualtieri had asked Smoke and several other intruders to leave his daughter's house, which he was helping build as a wedding present. They attacked him. Smoke apologized to Gualtieri in court, in one of several criminal cases arising out of the land dispute. The Haldimand County council ordered the removal of a native-made blockade in Caledonia. The only house that survived the land dispute at Douglas Creek Estates burned to the ground overnight on the morning of November 15. A lawyer who oversaw the class-action lawsuit by Caledonia residents is charged with fraud. Since the occupation began, many Caledonia residents have complained that they have been subject to threats and violence from Native protesters and that the Ontario Provincial Police (OPP) failed to take any action to protect them. David Brown, who lives with his wife near the disputed area, testified in court in November 2009 that he was required to carry a native-issued passport and needed approval from the protesters to enter his own house. He also claimed that after arriving "after curfew" one day, he was denied entry and jailed by the OPP when he caused trouble by ignoring the natives. Brown alleged that Native protesters threatened and harassed him repeatedly, and that rocks and mud were thrown at his family and their home. Brown and his wife are seeking $7 million in a civil lawsuit against the OPP on the basis that the police did nothing to protect him and his family during the occupation. In response to Brown's claims, Crown lawyer David Felicient stated that the situation "must be understood against the backdrop of the unique character of Aboriginal occupations and protests" and that the OPP were prevented from taking action due to "policy implications." Felicient also suggested that Brown had fabricated portions of his testimony to draw attention to his lawsuit. When Felicient asked why Brown kept a loaded shotgun, Brown responded that "We were doing what we had to do to stay alive. I had no protection from our government. I felt that I needed to protect my wife and my family." In court testimony, OPP Inspector Brian Haggith stated that the Native protesters "set up a checkpoint... Almost like they were entering another country," and that community lost confidence in the OPP's ability to protect them. Haggith also testified that when natives set fire to a wooden bridge in town, the fire department withdrew from fighting the blaze when threatened by protesters. The fire chief told the OPP he did not believe they would protect him or his men. In addition, an electrical substation was destroyed, causing more than $1 million in damage and a blackout, when a truck crashed through its gates and was left ablaze. Haggith said that there was little response from the police. Inspector Haggith also testified that he asked for a change in policy at a subsequent meeting he had with his OPP superiors, but that his request was denied. Wikimedia Commons has media related to Caledonia land dispute. ^ Adrian Humphreys, "Homeowner slept gripping a shotgun"[permanent dead link], National Post, 17 November 2009. ^ a b c d Adrian Humphreys, "Policies limiting OPP in native dispute, court told"[permanent dead link], National Post, 14 November 2009. ^ Branch, Government of Canada; Aboriginal Affairs and Northern Development Canada; Communications (2009-03-04). "Chronology of Events at Caledonia". www.aadnc-aandc.gc.ca. ^ "The Grand River "Surrender" of 1841" (PDF). Archived from the original (PDF) on 2007-09-28. ^ "Six Nations Solidarity". sisis.nativeweb.org. ^ "Aboriginal protesters remove barricade on road into Caledonia, Ont". Archived from the original on 2006-05-25. ^ "Police hurt, swarmed in Caledonia clash". Caledonia Land Timeline. CBC News. 9 June 2006. Retrieved 23 December 2015. ^ Limited, David Johnson, PRO-C. "Caledonia Class Action - Caledonia, Ontario, Canada". www.caledoniaclassaction.com. ^ "Court date set for Ontario to fight Caledonia ruling". ^ "Protesters can stay in Caledonia: appeal court". ^ "Controversial Figure Arrested At Caledonia Occupation Site". City News. 16 December 2006. Retrieved 23 December 2015. ^ "Feds say Six Nations land claim is invalid". 27 January 2007. ^ "OPP threatening to stop policing Caledonia: mayor". 12 April 2007. ^ "Native protesters delay Brantford development". September 4, 2007. Archived from the original on 2009-10-25. ^ "Natives end highway blockade - The Star". ^ "canada.com | Article". Archived from the original on 2009-06-25. Retrieved 2009-06-21. ^ "Minister calls Caledonia militia a 'dumb idea'". CTV News Toronto. The Canadian Press. 17 June 2009. Retrieved 23 December 2015. ^ Blatchford, Christie (11 July 2011). "Deal tries to hush up disgrace of Caledonia". National Post. Archived from the original on 2011-07-14. Retrieved 17 July 2011. ^ "County votes to remove barriers at native blockade site in Caledonia". 25 June 2014. ^ Carter, Adam (November 25, 2016). "Sole house to survive Caledonia land dispute in Douglas Creek Estates burns". Canadian Broadcasting Corporation. Hamilton, Ontario. Retrieved 7 April 2019. ^ McQuigge, Michelle (September 13, 2018). "Lawyer who oversaw Caledonia class action charged with fraud: police". Toronto Star. The Canadian Press. Retrieved 7 April 2019. ^ a b Kelly McParland, "Politics must never trump the law" Archived 2009-11-26 at Archive.today, National Post, 18 November 2009. ^ Native crates may have held AK-47s: Caledonia man's testimony[permanent dead link] by Adrian Humphreys, National Post, November 17, 2009. ^ Crown tries to cast doubt on Caledonia man's story[permanent dead link] by Adrian Humphreys, National Post, November 18, 2009. This page was last edited on 7 April 2019, at 13:22 (UTC).